I did a current events report on the discovery of the fastest millisecond pulsar ever found. Astronomers have discovered an ultra-dense neutron star that orbits with a dying stellar companion once every 93 minutes. It's the fastest ever found, moving at 8,100 m.p.h., or more. It's companion is even faster at 1,700,000 m.p.h. The companion is being evaporated by the pulsars gamma radiation. 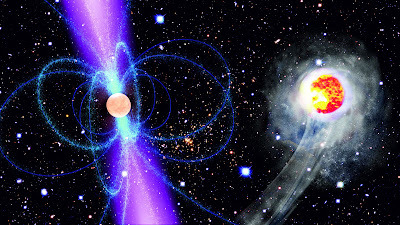 A pulsar is a dense neutron star that spins from 0.1 to 60 times a second. A pulsar is the contracted remains of a supernova explosion of a large star. The name "pulsar" comes from the word pulse, because of its two beams that can only be seen when pointing at you. Millisecond pulsars can rotate at 700 times a second or more. This is the first time scientists found a millisecond pulsar with just gamma-rays. Someone from the Albert Einstein Institute said "The discovery of the first MSP from direct gamma-ray pulsations opens the door to the detection of other extreme binary pulsars." The pulsar and its companion are separated by only 320,000 miles, 1.4 times the distance from Earth to the moon.The whole pulsar system is so compact it would all fit in the sun. Here are my other current events reports.